Champions is one of the early, classic super-hero tabletop role-playing games. Its first edition was in 1981, and it still endures as of this writing (2010s). 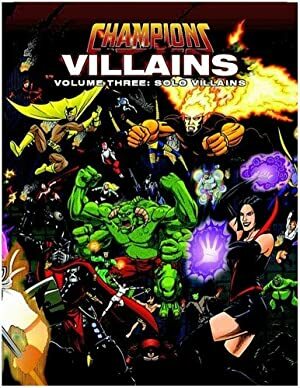 It has its own roster of characters, many of whom appeared across the decades and editions. Cheschire Cat, like Green Dragon, was one of the first sample villains in the earliest copies of the rulebook. As such is probably remembered by many old-school players. Newer versions of the character have him as part of a thieving group known as GRAB. I don’t intend on writing up the whole group, but others are of course welcome to do so if they desire. This writeup smushes Cheschire Cat’s profiles in the 3rd and 5th edition of Champions. 3rd had some thematically appropriate abilities not in the latter version, but 5th looks much cooler and has more background. Furthermore, I’ve taken creative liberties with the use and description said older abilities. Base Of Operations: Mobile . Height: 6’0” Weight: 210lbs . Bob Johanssen was in excellent shape even before his mutation. And said mutation may have boosted his already impressive natural abilities as well. He is remarkably swift and light on his feet, able to leap 30‘ straight up and outrun even the fastest Olympic athlete. His perception has grown more acute as well, to the point where he can even deflect oncoming bullets with just his billy club. Cheshire Cat is an exceptional hand to hand combatant. He is also remarkably strong for a man his size (perhaps a benefit of his mutation). 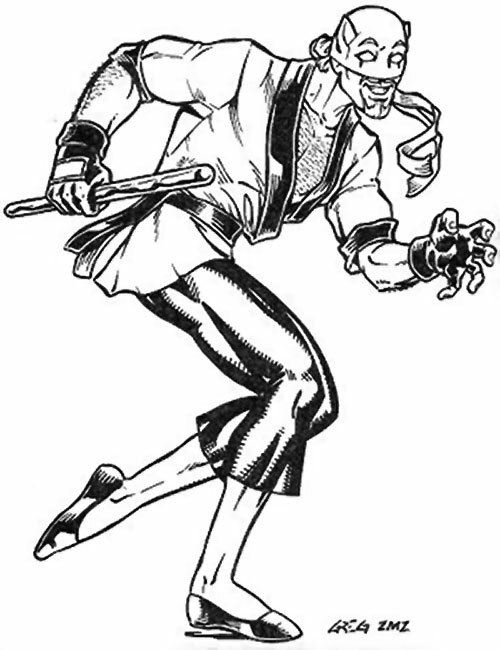 Highly skilled in aikijutsu, he uses this strength quite effectively with grabs and throws. He has also become adept at utilizing his teleportation and clinging in conjunction with his fighting skills. He will often blink in right behind, above, or next to someone to obtain a blindside bonus. Oddly, his metabolism cannot tolerate having other people teleport him. This will cause him severe pain. In addition to being able to teleport himself, Cheshire Cat has also developed the ability to open “teleportation gates” through which other people can travel. Depending on the distance, he isn’t always able to hold these gates open for long. Through diligent practice, he is hoping to extend the gate’s range and duration. He also possesses the ability to turn invisible. But doesn’t often take advantage of it. He finds it to be less than entirely dependable, and as such won’t rely on it. After all, when you can teleport out of sight in the blink of an eye, why bother? In only the most extreme cases will he display the ability to attack an opponent’s mental faculties. Upon looking into their eyes, his own body will disappear, yet leave his eyes and smile oddly visible. This effect will happen whether he is or is not previously invisible. The victim’s neurons are then scrambled, causing them intense cranial pain. Seeing as how this again limits the usefulness of his invisibility power, it too is rarely used. He finds it much easier to induce cranial pain by cracking someone in the head with his billy club. Still, it never hurts to have that ace in the hole. Bob Johanssen was a nuclear plant technician. Not a very good one, but he got by. For fun, he studied martial arts and spent time with his wife. One day, to his shock, his wife said she wanted a divorce. She was sick of living on his technician’s salary. She expected more of man, and Bob certainly wasn’t delivering. She moved out that very night, leaving Bob alone. The day he received the final divorce papers, he attempted to commit suicide by walking right into the heart of the reactor. Much to everyone’s amazement, he didn’t die. Instead he suddenly appeared, right out of thin air, on the other side of the plant! Bob wasn’t quite sure what to think of it, but he knew opportunity when he saw it. With superpowers, he could make himself so rich his ex-wife would eat her heart out with envy and regret! He didn’t want to conquer the world, spread misery and suffering, or launch grandiose schemes. He simply wanted to use his powers to get rich and live in luxury. As Cheshire Cat, Bob has spent several years as a gentleman thief, commiting robberies and avoiding trouble as much as possible. He has been quite successful. Robert “Bob” Johanssen is a handsome, blond haired man with an infectious smile and the body of an athlete who trains intensively. As Cheshire Cat, he wears a white Gi-like top with red trim and a red sash, and red calf length pants and slipper-style shoes. His fingerless gloves are red, and his half-face, cat-eared mask (including the eyes) is white. Cheshire Cat has a borderline bi-polar personality disorder. Most of the time, he’s quite cheerful, or at least neutral. However, a sustained run of failures or bad luck may plunge him into a deep, dark depression from which it may take him a long time to recover. This never seems to affect his abilities, so it isn’t listed as a psychological instability. But it’s worth noting for role playing purposes. Cheshire Cat doesn’t want to kill or seriously harm anyone. After all, he’s really only in this for the money. But he has no objection to administering a good beating to his enemies. He particularly likes to defeat other superpowered martial artists, to prove he’s better than they are. Bob is something of a skirtchaser. He doesn’t hit on his teammates, since that would be awkward. But he’s not above making a pass at a superheroine who catches his eye. He can be rather dashing when the mood strikes him. He would likely be introduced as a minor Bat-villain, a sometimes rival to, or rival for the affections of, Catwoman herself, before striking out on his own outside of Gotham City. He could also be a sympathetic villian that comes to the heroes for help when Cheshire comes looking to kill him for using her name. Mind Blast is Seriously Marginal, Contingent on Invisibility, and must make eye contact with victim. Use causes his invisibility except eyes and mouth remain visible (-1 CS AV/EV to perception check). Superspeed cannot replace Dex, HTH EV, or subtract from time to perform a task. Attractive, Familiarity (Hockey), Familiarity (Nuclear Technician), Expertise (Superhuman World), Expertise (Martial Arts World), Lightning Reflexes, Luck. MIA to Facing other superpowered martial artists, SIA to Greed, CIA: Will not kill, Public ID, Fatal Vuln: if others teleport him. Billy Club [BODY 05, EV 04, Reflection/Deflection(Deflection only, user linked to Dex)*: 08]. 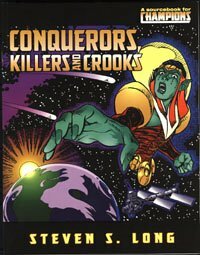 Source of Character: Hero Games’ Champions products, 3rd edition rulebook, Conquerors, Killers & Crooks specifically. Helper(s): KalEl el Vigilante, Adam Fuqua.